People stage a protest against abortion at the gates of Our Lady of Lourdes Hospital today. HALF A DOZEN people who are anti-abortion are holding a protest outside Our Lady of Lourdes Hospital in Drogheda, Co Louth today. One of them is Charles Byrne, who took an unsuccessful legal challenge to the outcome of the referendum on the 8th amendment. The group is holding placards saying ‘Abortion is murder’, ‘Let him be born’, ‘Killing in progress’, and ‘Let her be born’. The HSE said it is not commenting. Speaking at a press briefing today, Health Minister Simon Harris said he was committed to introducing safe access zones around hospitals providing abortion services. “In many ways, I think it is quite sad, to be honest, that we have to… That people would endeavour to intimidate people, be they doctors or nurses or midwives, or people going in and out of our health services… is indeed upsetting,” he told reporters. He said that he had seen pictures from Drogheda where people are protesting but added that patients entering the hospital should not have to put up with the extra burden of the demonstration. The timing of the legislation necessary for safe access zones is not yet known. Harris also commented on a tweet sent yesterday claiming that an abortion would take place at a specific hospital today. “I find it extraordinarily unedifying, I find it pretty darn despicable actually, that somebody would take to social media… and endeavour to create a public conversation about an individual patient’s care,” he said. Any service that is provided legally here in our country deserves to be treated with absolute respect and the confidentiality of a patient must be to the fore. “I have spoken to the Director General about this, this morning, and I know the HSE shares this view. We will defend and protect patient confidentiality for any woman, indeed any citizen accessing any health service. 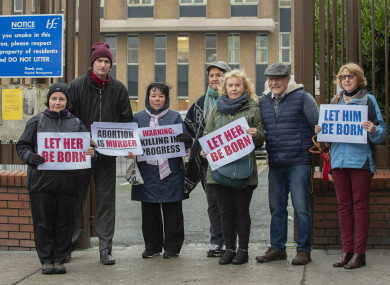 Email “'Hospitals need to be places of care': Anti-abortion protest held outside Drogheda hospital ”. Feedback on “'Hospitals need to be places of care': Anti-abortion protest held outside Drogheda hospital ”.